The Screen Options menu opens. At the bottom of the Screen Options menu is a menu heading titled Screen Layout. Choose the number of columns you want displayed. You have the choice of 1, 2, 3, or 4 columns. Select the radio button to the left of the number you want, and your Dashboard displays the changes immediately. Close the Screen Options menu. Click the Screen Options tab again to close the Screen Options menu. In the figure, the Dashboard is shown in a one-column layout. Also note that most of the Dashboard modules are almost all closed. You can expand (open) and collapse (close) them as you need to, based on what you need to see and do within your Dashboard on any given day. 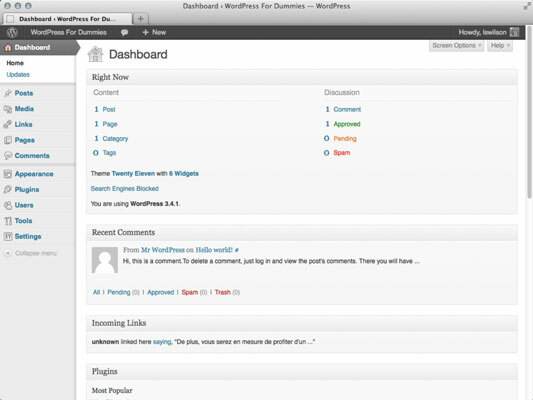 Using the features that enable you to customize your Dashboard, WordPress allows you to create your own, individualized work space that works best for you, based on how you use WordPress. With these features, everyone can customize their own WordPress experience, and it’s possible that no two WordPress user experiences are the same — like snowflakes!